Imagine a welcoming and nurturing school environment that encourages gifted and talented students of diverse populations to become resourceful, critical thinkers who are self-starters and aware of their own potential and passion; students who develop a lifelong love of learning, where creativity and expression of individual talent is encouraged; students who thrive on an accelerated curriculum, develop excellent organizational skills and the ability to determine the best approaches to problem-solving situations; students who think of themselves as globally responsible citizens with an emphasis on social justice and community service; students who have the ability to assess subtle differences in content areas and theories by developing strong research and higher-order thinking skills and the confidence to take risks; and through school emphasis on social-emotional counseling, students who are able to make independent, responsible life choices. From the earliest ages of kindergarten through eighth grade, the fostering of such an environment is the mission of the Regional Gifted Centers of the Chicago Public Schools. Current nationwide surveys suggest that one of the largest underachieving segments of student populations in the American classroom today is the gifted learner. Gifted learners come in many overlooked “disguises”—be they “twice-exceptional” students (gifted students with disabilities), English-language learners, gifted girls, gifted rural populations, or students who come from lower socio-economic backgrounds. Regional gifted centers are creating a pattern of success with administrative and teaching staffs dedicated to helping each child discover and celebrate his/her own unique gifts and talents. Chicago Public Schools’ Regional Gifted Centers offer full-day gifted instruction to students beginning in kindergarten or first grade. These schools provide academically gifted and motivated students the opportunity to complete the elementary school curriculum by the end of the sixth grade, followed by honors-level high school instruction in the seventh and eighth grades. A gifted student in a regular classroom often feels lonely at the top of every class academically. At Regional Gifted Centers, students challenge each other and have the opportunity to socialize with their age and academic peers. 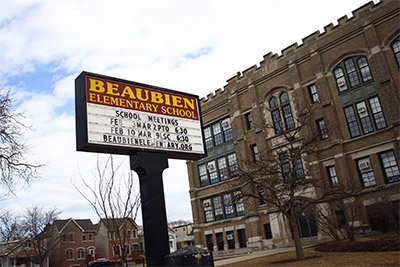 Regional Gifted Centers are consistently recognized as top elementary and middle schools in Chicago and students graduate from these programs prepared to attend the city’s most academically rigorous high schools.